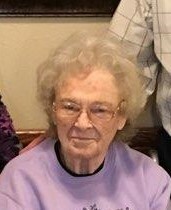 Betty R. Earl, 95, formerly of Carey, died Friday, Feb. 8, 2019, at 6:29 a.m. at The Inn At Westbrook, Upper Sandusky. Born in Carey, Sept. 20, 1923, she was the daughter of the late Forrest C. and Mabel M. (Smith) Wenner. On Aug. 17, 1941, in Napoleon, Betty married Ervin L. Earl and he preceded her in death Dec. 8, 2003. She is survived by three children, Charles (Patricia) Earl of Bowling Green, Karen (David) Stombaugh of Carey and David (Deborah) Earl of Tiffin; six grandchildren; eight great-grandchildren; three great-great-grandchildren; four siblings, Rose Ann (Roger) Woods of Carey, Kenneth (Norma) Wenner of Powell, Eugene (Barbara) Wenner of Prior Lake, Minnesota, and Wendel (Sybrig) Wenner of Carey; and two sisters-in-law, Marita Wenner of Tiffin and Shirley Wenner of Findlay. She was preceded in death by a granddaughter, Nora Mae Stombaugh; two brothers, Jack and Charles Wenner; an infant brother, Melvin Wenner; and a sister, Eva Moore. Betty was a 1941 graduate of Carey High School. She was a homemaker and assisted her husband on the family farm. She was a life member of Trinity United Church of Christ in McCutchenville. She was a member of Warpole Chapter No. 366, Order of The Eastern Stars, Upper Sandusky, Women’s Club, Carey and she was the past secretary for the Board of Tiffin-Seneca County Library. Visitation will be 9-11 a.m. Wednesday, Feb. 13, 2019, at Trinity United Church of Christ, McCutchenville. The funeral will begin at 11 a.m. at the church with Pastors Karen Fraser Moore, Paul S. Frasure and Rick Dorsch officiating. Burial will follow at Bethel Cemetery, McCutchenville. Memorial contributions may be made to Trinity United Church of Christ or Hospice of Wyandot County and sent to Stombaugh-Batton Funeral Home, 225 West Findlay Street, Carey, Ohio 43316-1169. Online condolences may be sent to StombaughBatton.com.